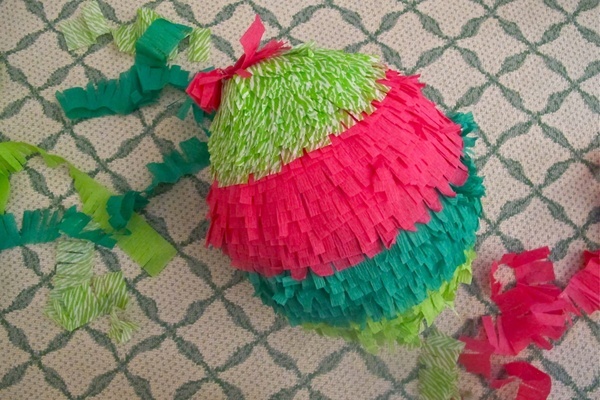 What I love about the piñata is the joy it renders from its simplicity. 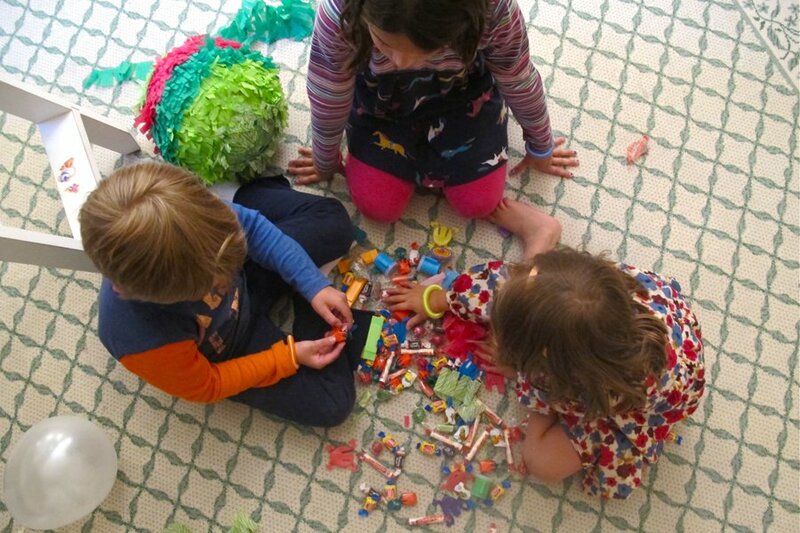 Just a few bits of colored paper, glue, and penny candy yields revelry, squeals of delight, and, inevitably, a few tears (that's what happens when you blindfold children and give them a directive to whack whatever's in front of them). Whether at a Hispanic Lenten festival, Central American quinceañera, or backyard birthday barbecue, the swinging piñata takes center stage. It has been that way for centuries. The ancient Aztecs and Mayans used clay pots and handmade trinkets for their proto-piñatas; 16th-century Chinese made paper animal figures filled with seeds for the new year. 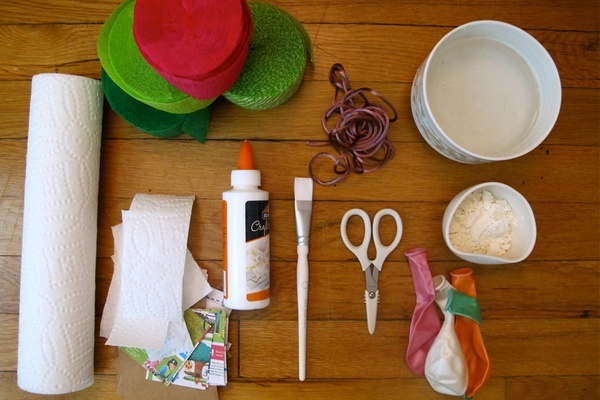 For a little Saturday afternoon crafting kitsch, make one out of papier-mâché and fill with old-fashioned candies and tiny toys. 1. 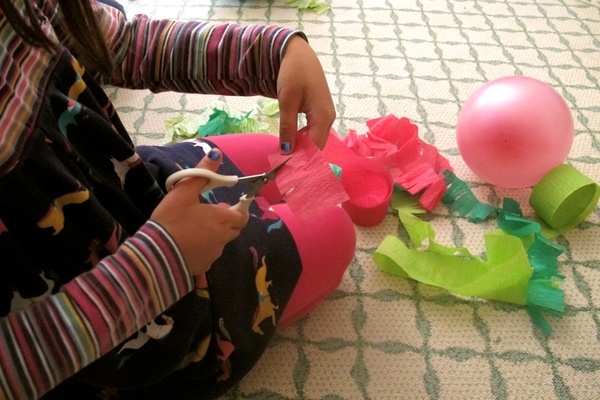 Inflate the balloon and secure with a piece of ribbon at the knot. 2. Prepare the paper maché by dipping a square of newspaper into the flour/water mixture, and wiping down excess moisture. 3. Drape over balloon, smoothing out the surface of the paper. 4. Repeat with more dipped squares of paper, making sure to cover every inch of the balloon. 5. Hang balloon to dry. 6. Once dry, cover balloon with a second layer of paper dipped in the flour/water mixture. Use strips of dipped paper towels on the curviest portions of the balloons for the smoothest effect. 7. Smooth for air bubbles and let dry again. 8. 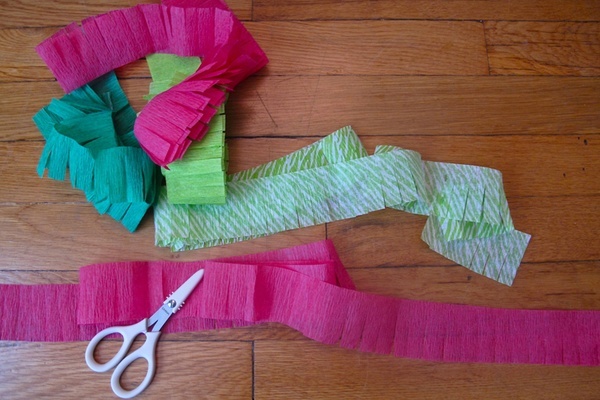 In the meantime, cut strips of crepe paper into fringe. 9. 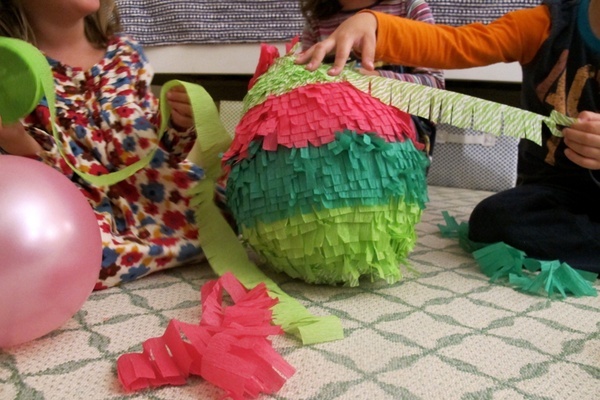 Once the pinata is completely dry, cut a hole at the balloon knot to release air. Completely deflate and remove balloon. 10. Starting from the widest part of the piñata, attach fringe with tacky glue. 11. 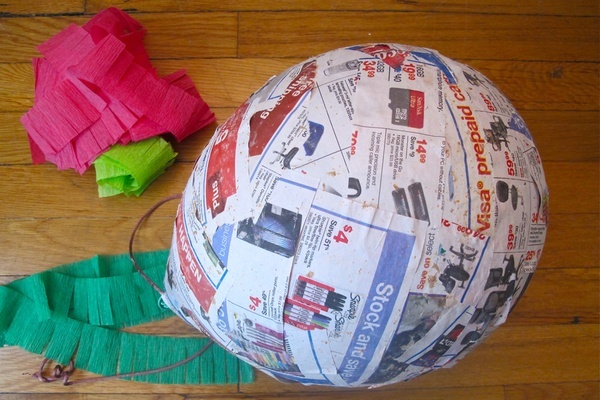 Work your way around the piñata, layering the fringe so that no part of the newspaper peeks through. 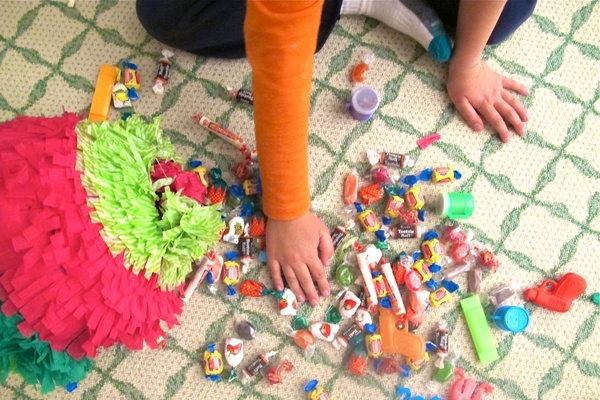 12: Fill the piñata 3/4 of the way with trinkets and candy. 13. Knot a piece sturdy string at the top of the piñata and stuff the rest of the hole with crepe paper. 14. Hang out of reach, blindfold the kids, and let them go at it with a baton or piñata stick!